• For quantitative assay of adipolysis and evaluation of drug effects on adipolysis. • Rapid and convenient.The procedure involves addition of a single working reagent and incubation for 20 min at room temperature. • Obesity is a chronic condition that develops from storage of excessive energy in the form of adipose tissue. The resulting adiposity presents a high risk factor for diseases such as type 2 diabetes, cardiovascular diseases, and cancer. ADIPOLYSIS or lipolysis is a highly regulated process in fat metabolism, in which triglycerides are broken down into glycerol and free fatty acids. Rapid, robust and accurate procedures for adipolysis quantification in cell culture are very useful in research and drug discovery. BioAssay Systems adipolysis assay kit directly measures glycerol released during adipolysis. 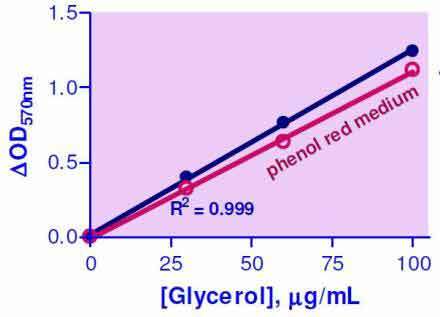 This homogeneous assay uses a single Working Reagent that combines glycerol kinase, glycerol phosphate oxidase and color reactions in one step. The color intensity of the reaction product at 570nm is directly proportional to glycerol concentration in the sample. 1. I collected the medium from the culture wells. Do I need to now centifuge the medium and collect the supernatant or do I use the medium itself for the assay? You can assay the cell culture medium directly. However, if it contains cellular debris you should first centrifuge it and then use the clear supernatant in the assay. 2. What is the principle of the assay? 1) Glycerol kinase converts glycerol and ATP to glycerol phosphate and ADP. 3) HRP converts ADHP and H2O2 to resorufin and water.